There is no need to say anything other than that this film says everything you need to know about Israeli racism. The idea that such behaviour would be tolerated if it was a Jewish child is too absurd even to contemplate. The Jew who stabbed another Jew by mistake, he meant to stab an Arab, was granted anonymity by the court and remanded for psychological reports. Palestinians don’t get psychological reports, just beatings and torture. A controversial video was leaked to Palestinian media on November 8th, revealing an aggressive Israeli security interrogation of 13-year old Ahmad Manasra, who was indicted on October 30th by Israel’s Jerusalem District Court for attempting to murder two Israelis near the Pisgat Zeev settlement in East Jerusalem. The 10-minute video depicts an Israeli interrogator verbally abusing and shouting curses at the visibly distressed boy, rigorously questioning his motives and accusing him of murder. The video then appears to show the young teen confessing to the crime under considerable duress. Since the footage has gone viral there has been a strong public outrage, with rights-based groups condemning what appears to be a violation of the rights afforded to the treatment of minors in custody. Between the barrage of shouting and curses, Manasra can be heard saying “maybe I am going crazy”, and asks the officer to “take me to the doctor to check me”, all the while screaming and hitting his face with his hands. The officer continuously yells “liar!”, and tells Manasra to “shut up”, saying that he is accused of killing “two Jews” and that he supported “the enemy in time of war”. The boy is clearly confused by the statement, and asks “what war? What do I have to do with a war”? Before the release of the interrogation footage the case made headlines when Palestinian President Mahmoud Abbas mistakenly stated that Israeli security forces had executed Ahmad Manasra after the stabbing attack. During the incident, which occurred on October 12th, two Israel’s aged 13 and 21 were seriously injured and Manasra’s 15-year old cousin, Hassan, was shot dead by Israeli forces. A car knocked Mansara down as he tried to flee the scene. According to local news source Ma’an, the court rejected the family’s pleas that Manasra be placed under house arrest. Instead, he will be detained in a closed facility in Galilee until his prosecution, with his next court date set for December 6th. 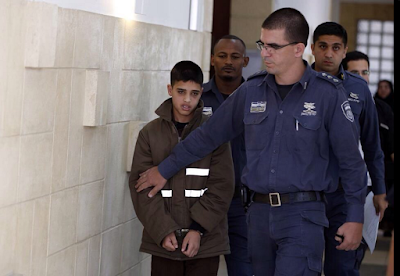 Under current Israeli legislation, Manasra cannot serve a prison sentence until he turns 14 in January, after which he could face years of incarceration. However this particular case has prompted the Israeli Justice Ministry to draft a bill a few days ago, in which children as young as 12 could be given prison sentences if convicted of manslaughter, murder or attempted murder. The bill will apply to Palestinian residents of Jerusalem, despite the fact they are not citizens of the state of Israel. Sadly, it doesn’t seem as if Manasra will be the last of such cases involving Palestinian minors. 12-year old Ali Ihab Hassab Ali was shot three times after stabbing an Israeli guard in Jerusalem yesterday, and is currently being held under Israeli police custody in Hadassah hospital. 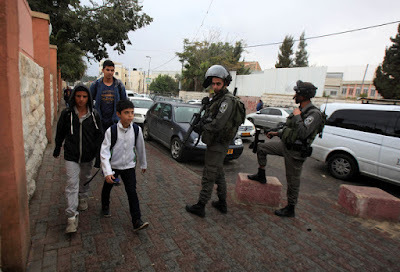 Arresting and detaining Palestinian children without a trial in the Israeli military courts is a common method employed by Israeli forces in an attempt to deter involvement in resistance or violence. According to the human rights association Addameer, approximately 700 Palestinian children under the age of 18 are arrested, interrogated and detained by the Israeli army every year. Indeed, the Israeli military raided a home in Hebron last month, seeking to arrest a Palestinian boy accused of throwing stones only to discover he was 3-years old. In a report released in July 2015, Human Rights Watch stated that “Israeli security forces have used unnecessary force to arrest or detain Palestinian children as young as 11”, including choking them, throwing stun grenades at them, beating them in custody and interrogating them without the presence of parents or lawyers. To date 77 Palestinians have been killed since the beginning of last month, 13 of whom are children killed by Israeli forces in what are being condemned by rights groups such as Amnesty International as “unlawful” killings which resemble “extra judicial execution”. The increased use of extreme methods harnessed by the Israeli military in reaction to the current spate of violence raises grave concerns over how Palestinian minors are treated, under a judicial apparatus notorious for the systematic ill-treatment of children. A total of 56 Palestinian children are being held in Givon, 20 of whom are from the West Bank, according to the Palestinian prisoner advocacy group Addameer. Lawyers with the Public Committee Against Torture in Israel and Defense for Children International-Palestine are also investigating the prison’s conditions.